A day after Camurlim panchayat accused government departments of being in league with the sand mafia, the Bardez mamlatdar office along with the mines department conducted a surprise raid at Camurlim and NH66 (NH17) at Karasvadda and Colvale to check illegal sand extraction, if any, early Sunday morning. Although no illegal sand extraction was found taking place in Camurlim, the raiding party which was accompanied by police seized nine trucks on the NH66. Five trucks were seized at Karasvadda and four at Colvale. Sources informed that seven trucks were loaded with sand, one with laterite stone and one with basalt stone. Severn trucks were plying from Pernem to Mapusa while two were moving from Kudal, Maharashtra, to Mapusa. 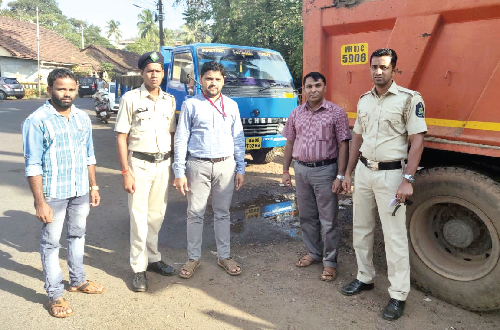 The mines department has handed over the five trucks seized from Karasvadda to Mapusa Police Station while the other four were handed over to Porvorim Police Station due to lack of space in Mapusa. Joint Mamlatdar Sandeep Gaude and mines department official Sudir Mandrekar along with Mapusa police officials were part of the raiding party. It may be recalled Camurlim Sarpanch Vishant Gaonkar along with all panchayat members had on Friday said that sand mafia controlled sand extraction business in the village and accused government departments to be hand in gloves with it.